"Players take on the role of Explorers in uncharted Africa. The circular playing counters are placed upside down in random locations upon the various circles of the board. Each turn the player may elect to move his explorer to a revealed location anywhere on the board, or move twice, each turn moving 0, 1 or 2 adjacent revealed spaces. The explorer may then take an action, such as reveal an unrevealed tile, or move various revealed tiles to other locations. Needless to say the theme is a bit of a veneer upon what is essentially an abstract game. The tiles represent trade goods (of various sets), nomads, herds of animals, gold/ diamonds, and monuments. When the 11th monument is revealed, the game ends. 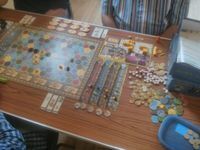 This being a Knizia game there are various methods of scoring the revealed tiles, including immediate points, delayed points, opportunity points and end points. The game components are well made in thick card, with some nice blue plastic pyramids(tents) and are likely to stand up to usage. The artwork is colorful without being garish, clearly presented and functional without being fussy. Each player also is provided with a very useful index card sized thick card reference sheet, which more or less encapsulates all the game rules upon it- a good idea which is to be commended to other designers." "This abstract game consists of 108 wooden blocks with six different shapes in six different colors. There is no board, players simply use an available flat surface. Players begin the game with 6 blocks. The start player places blocks of a single matching attribute (color or shape but not both)on the table. Thereafter,a player adds blocks adjacent to at least one previously played block. 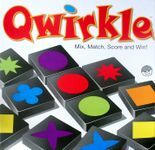 The blocks must all be played in a line and match, without duplicates, either the color or shape of the previous block. Players score one point for each block played plus all blocks adjacent. It is possible for a block to score in more than one direction. If a player completes a line containing all 6 shapes or colors, an additional 6 points are scored. The player then refills his hand to 6 blocks. The game ends when the draw bag is depleted and one player plays all of his remaining blocks, earning a 6 point bonus. The player with the high score wins." Scrabble with shapes and colours . Swami has said I can call he a muppet as he was rolling the dice to change the colour. He found this extremely hard to do and failed every time. Swami you are a MUPPERT! Some luck getting the right Colour/shape at the right time but it makes you think. "All of the eligible young men (and many of the not-so-young) seek to woo the princess of Tempest. Unfortunately, she has locked herself in the palace, and you must rely on others to take your romantic letters to her. Will yours reach her first? Love Letter is a game of risk, deduction, and luck for 2–4 players. Your goal is to get your love letter into Princess Annette's hands while deflecting the letters from competing suitors. From a deck with only sixteen cards, each player starts with only one card in hand; one card is removed from play. On a turn, you draw one card, and play one card, trying to expose others and knock them from the game. Powerful cards lead to early gains, but make you a target. Rely on weaker cards for too long, however, and your letter may be tossed in the fire!"